I am ready for the weekend already. I was so excited when I got the e-mail yesterday saying my Studio Calico box had been delivered. I called Mike and told him to get it off the porch. So I was a bit mad last night when I went to get my hair cut and highlighted that he double booked. I am usually there a little over 2 hours, last night it was 3 1/2. Making me get home too late to see my kiddos and too late to do anything else. So I am looking forward to enjoying my box tonight. 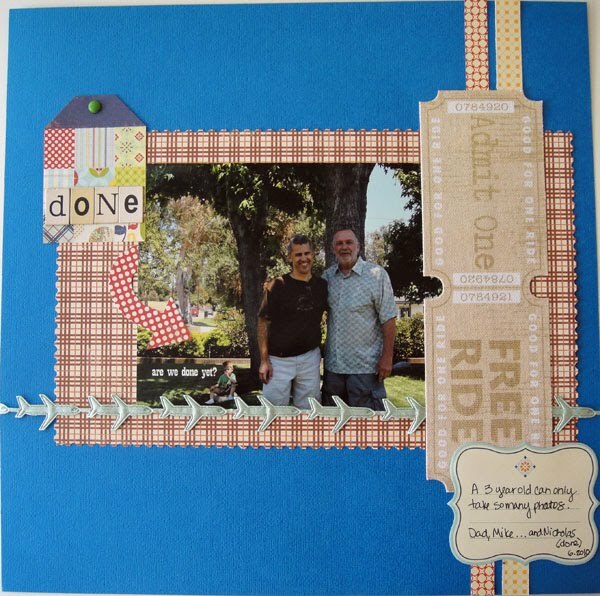 In the meantime here is another layout from the Kelly Purkey Sketch class I am taking at Studio Calico. It may be a little hard to see, but when I was going through the pictures from a Fathers Day family photo shoot, I saw this one with Nicholas sitting in the back completely done with the picture taking and definitely ready to go back to playing. So I couldn’t resist scrapping this outtake from the shoot. Great layout! I love how you highlighted something that wasn't the main subject. I'm not a patient person, so 3 1/2 hours at the hairdresser would have made me crazy! Ha! That's great! Those outtakes are often the best pics! Glad you got the package and love the page!